Details: And now for something completely different! Ending today's batch of photos is this one taken under the flyover near Reeves Corner in Croydon on 17th June 2018. It shows fleetnumber 482 of Quattro plant hire, a Mecalac 11cx wheeled excavator fitted with a platform lift. This road-rail vehicle has been used by Tramlink for overhead wiring maintenance access for a while now. The use of convertible road-rail vehicles for railway maintenance work really took off during the 1990s and a wide variety of types can now be seen including lorries, tracked bulldozers and excavators, and wheeled cranes and platform lifts. Some road-rail vehicles are capable of driving on public roads and these will obviously need to have road number plates. The vehicle shown here is plated as AJZ9912 but it does not appear to have been licensed as such. 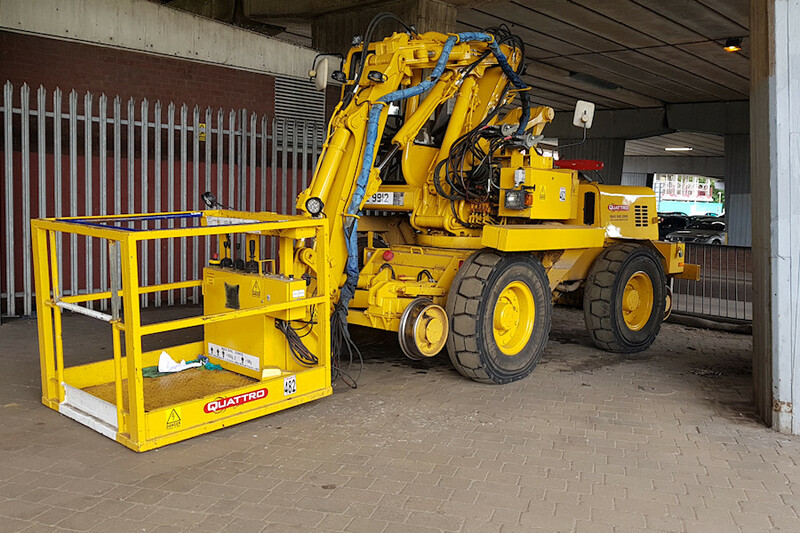 In most cases, the road-rail capability is used more for getting to the actual work site without having to run too far on rail tracks. A typical job would see the vehicles moved by road low-loader to a nearby access point. They would then be driven on to the tracks, switch to rail mode and driven to the worksite. I like machines of this type, and I often find myself wondering what all the parts do. For example, the function of the hydraulic ram along the top-most 'limb' is not clear. Does it perhaps slew the end arm from side to side? I also often ponder how I could make a version of the machine using Lego Technic, though this one would be very challenging.